The 20th century saw revolutions in scientific medicine, consumer culture, and social welfare, and in the understanding of human development and potential, explains Janet Golden. And while many intellectual thinkers, scientists, and industrial innovators helped to lead America into this new age, says the professor of history at Rutgers University-Camden, credit also goes to our youngest members of society: babies. Taking a "cradle-up approach," Golden examines the critical role that infants played in joining ordinary Americans to the modern revolutions of the 20th century in her forthcoming book, Babies Made Us Modern: How Infants Brought Americans into the Twentieth Century (Cambridge University Press, 2018). According to the Rutgers-Camden scholar, she primarily focused her research on studying the actual experiences of infants. With assistance from Russell Johnson, a librarian and archivist at UCLA biomedical library, she culled information from hundreds of baby books, the majority of which were kept by mothers. "Baby books document not just the care and treatment of infants by families, but infants' changing material worlds, helping us to shift assumptions about their inner lives, and the role that governments, private organizations, and medical institutions and health professionals played in their care and protection," she says. Golden also examined a range of other materials as well, including folklore, Japanese-American internment camp newspapers, the records of nurses on Native American reservations, oral histories from the Great Depression, Congressional hearings, and letters sent to the Children's Bureau. Her book essentially makes two arguments: first, she says, as infant mortality rates fell, public investment in infants declined and shifted to means-tested programs serving poor infants with the expectation that other babies' welfare would be a private family matter. 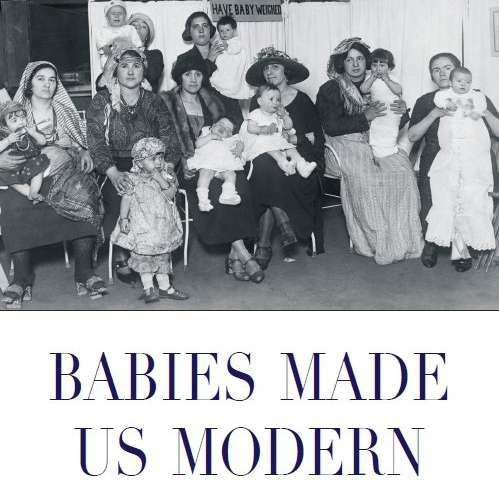 Secondly, as the title of the book states, babies helped to modernize American society. She explains that, in 1900, 100 infants out of 1,000 died before their first birthday, resulting in a collective interest in infant welfare. Reformers undertook new efforts to save the lives of babies, including private charity work, as well as state and local government programs. In 1912, the United States became home to the first national government agency devoted to children, the United States Children's Bureau. Working within severe fiscal and legislative restraints, the bureau's leaders succeeded in creating programs to educate mothers, helping to make infant care routines orderly and scientific. "Put simply, more babies survived because of our government's efforts to combat infant and maternal mortality," says Golden. According to Golden, World War II proved to be a turning point, first by "knitting infants and government into a tighter bond and then, in the postwar years, by quickly unraveling a relationship that had built up over the previous decades." In wartime, she says, the federal government underwrote the delivery and care of one out of every seven babies born in the United States - 1.2 million in all. With declining infant mortality rates, growing numbers of Americans insured through their workplaces, an expanding middle class and a booming national economy, subsequent programs for babies would be means-tested, meaning the family's financial status would be examined to determine eligibility for public support. "With this in place, 'our' babies became divided into 'my' babies and 'other people's' babies," says Golden. As the Rutgers-Camden researcher explains, the baby boom years - 1946 to 1964 - brought 76 million new Americans amid a growing economy. Consumer culture reached new heights, and purchases for babies accelerated as new specialty products for them came on the market. "Purchases for babies, seen as necessary to saving their lives and health, spurred poor and working-class families to move from reliance on folk remedies, homemade goods, mothers' milk, and table foods," she says. The role of "salesbabies," hawking everything from revolvers, to cigars and war bonds became prominent in American culture. In addition, babies played a role in linking ordinary families to financial institutions. After World War I, "Buy now, pay later" credit and installment plans enabled families to purchase big items like carriages, cribs, and high chairs, along with baby bottles, baby food, and baby clothes. "Many families entered the world of consumer culture by way of their infants, making purchases for their babies when they had little money to spare," says Golden. Among the many other advancements that took "baby steps," says Golden, psychology assumed an increasingly powerful place in American life in the 20th century - in higher education, in professional practices such as social work, and in popular culture. Reflecting on her research, Golden encourages others to save those old family baby books and send them to an archive. "These records," she says, "put together with a variety of other sources, reveal how infants were integral to the growing cultural authority of scientific medicine, the robust expansion of the consumer economy, the rise of new theories of self and society, and the increasingly complex relationship of the state to the family."